Here’s a crisp wintery salad that is the perfect accompaniment to the Zweibelkuchen recipe. 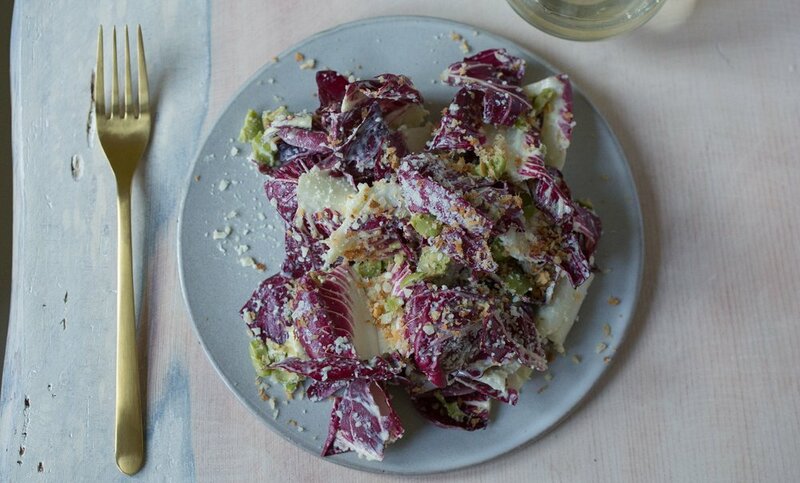 What we like best about radicchio, besides its color and its great bitter flavor is that it keeps really well in the fridge. Just plop in an ice bath to refresh, and it’s good as new. This salad is adorned with buttery green olives, salty parmesan cheese, and crunchy garlicky breadcrumbs to elevate it to out-of-this world! Make the salad dressing by either whizzing in the blender or whisking by hand: the oil, lemon, mustard. 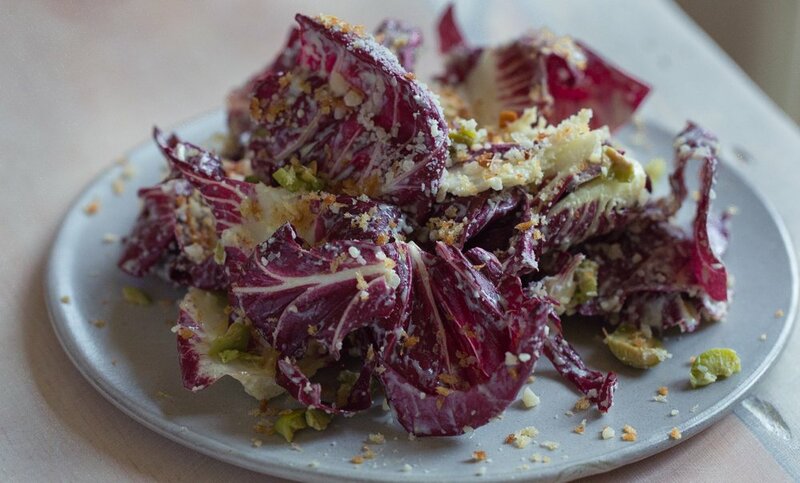 Dress the radicchio, scatter with all but a bit of the parmesan, and mix together until the radicchio is deliciously coated. Feel free to sample a leaf or two to make sure. Heat the butter in a skillet until melted and, using a Microplane, quickly grate in a clove of garlic. Add the panko and stir until toasted. Once again, scatter all but a little bit over the salad and mix. To serve: scatter the reserved breadcrumbs and cheese scattered on the plate, along with the olives.